Enjoy the ability to control access to a door or area by means of, well, locks. Locks come in many forms to secure doors but the control is in the means of opening the lock. 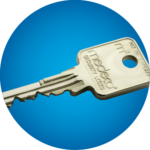 Choose from standard keys (like your home door key) or high security keys that can't be duplicated. 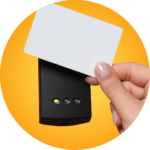 Our access card systems can work with computer-based programming with virtually limitless options for individual cards. You can control who has access to what doors and when. Security can be monitored with audit trails. Choose from standard, mechanical locks in which everyone uses the same code or electronic digital ones that allow many individual codes. You can set access times and view audit trails to see who used the lock and what time they entered. This relatively new field includes fingerprint identity, retinal scan or other physical attributes for access. 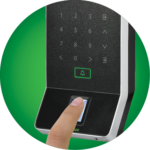 Biometric access is often used in the most security sensitive areas. Choose from a selection of products to fit your needs.